Jim Candelaria, a Republican candidate for Montezuma County commissioner, obtained a state permit to grow a crop of hemp. As part of his campaign, he is advocating growing hemp to help the local economy. Hobby gardener Jan Candelaria explains her experience growing hemp in a greenhouse for the first time. “They grow well and are resilient,” she said. Flowers of hemp plants are collected and dried then sent to bioextraction companies that extract the CBD used for medicines. 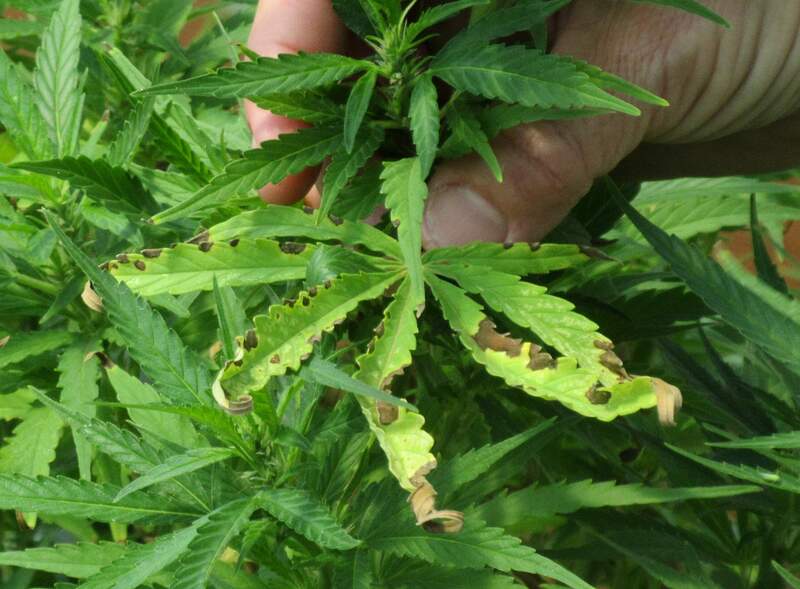 A fungus hit a few of the greenhouse hemp plants and are being treated with an organic fungicide. 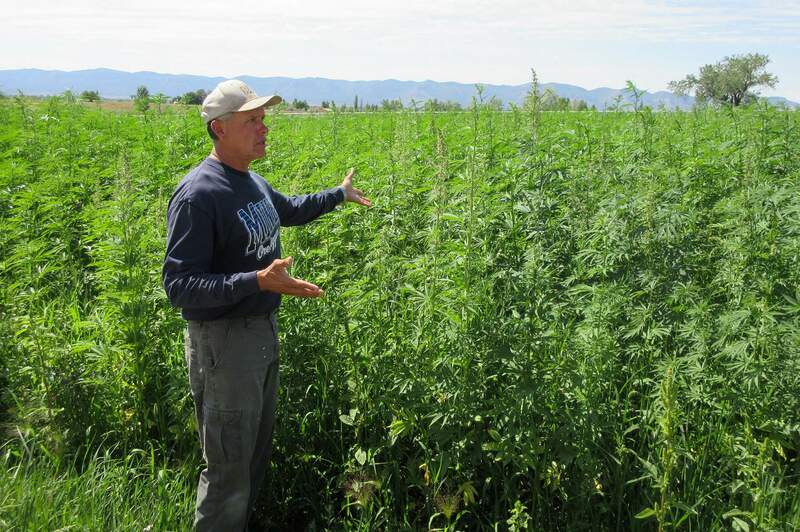 On a recent sunny day, Republican candidate for Montezuma County commissioner Jim Candelaria stood next to his flourishing, 6-foot-tall hemp crop. The local builder and former firefighter admits he is not a farmer, but he strongly believes industrial hemp is a crop that can boost the local economy. “I’m a doer more than a talker and did not want to advocate growing hemp without learning how to do it myself,” he said. Industrial hemp is not the same as the marijuana drug, Candelaria emphasized, and does not have intoxicating qualities. 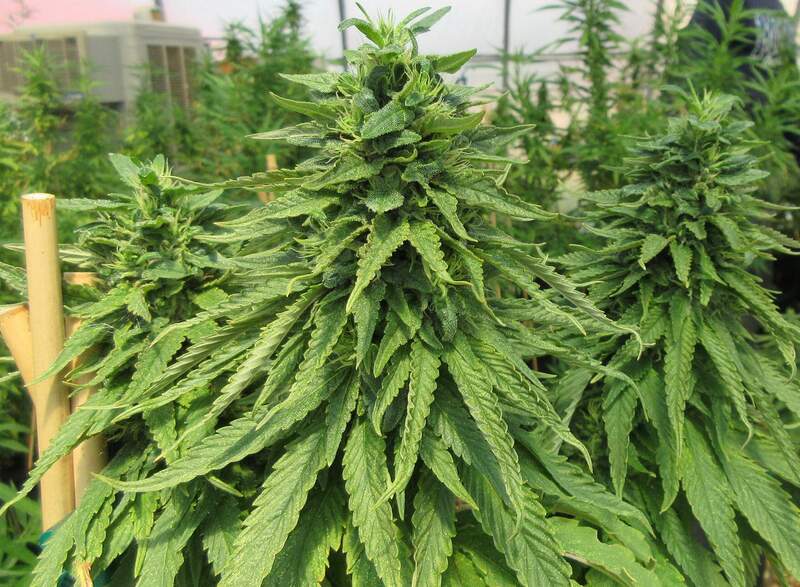 Hemp contains almost zero THC, the psychoactive ingredient prevalent in marijuana. Fibrous hemp stalks are used to make textiles, paper, rope, and as a substitute for plastic. The seeds are used for fuel and food, and the oils from the flowers can be extracted for medicinal uses. “There are thousands of industrial uses. The medicine hemp produces is proven to be beneficial and is safer than opioids,” Candelaria said. He teamed up with his wife, Jan, and two friends to grow experimental crops of hemp. They planted a 3-acre field from seed to harvest for fiber, and are growing 130 hemp clones in a greenhouse to harvest the flowers for medicinal cannabidiols, or CBD. There has been a learning curve, but overall, it is going well, they said during a recent tour. The application for a hemp permit is available on the Colorado Department of Agriculture and is a “pretty easy process,” Candelaria said. It costs $500 per year, plus nominal costs per outdoor acre and indoor square feet. Candelaria said an initial mistake was taking a no-till approach because the hemp was taken over by hay. Weeds and pests have not been a problem, and the crop was not damaged by recent 50 mph winds. Before harvest, hemp growers contact state inspectors, who have a 30-day window to visit and take random samples to make sure the crop is not higher than .3 THC content. 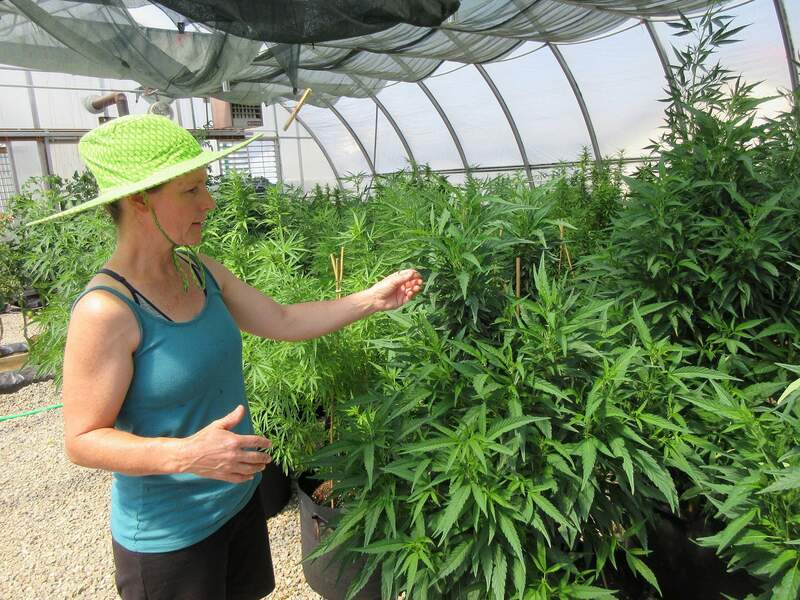 Over at the greenhouse, Jan Candelaria tends to 130 bushy, potted hemp plants being raised for their medicinal flowers. A hobby gardener, Jan has a parental attitude toward the plants, making sure “they are happy” and taking steps when they appear to struggle. If one looks stressed, she relocates it to a cooler spot or adds nutrients to the soil. For example, when a hemp plant is hurting, it will flower too early. But when conditions are improved, the plant quickly goes out of the flowering stage and grows strong again to flower at the ideal time, after about 90 days. Because of their heavy flowers, the plants need to be staked, she said. At harvest, the plants are cut down and dried, then the flowers bucked off and sold to a bioextraction company for the cannabidiols. A few plants have developed a fungus that Jan has been treating with an effective organic fungicide. Fresh air is constantly pumped into the greenhouse, and plants are watered every other day. Growing indoors in season is probably not ideal, Jan said, because it generates too much heat. Growing off-season in a greenhouse allows for better control of temperature, but artificial lighting would be needed due to the shorter days. The Candelerias are still researching how to best harvest and sell their fiber and medicinal hemp products, but that is part of the learning process. “We are taking the bumps and bruises in order to help others who want to give it a try,” Jim Candelaria said. He envisions a local hemp market where if enough farmers plant the crop, it opens up the potential for additional hemp-related businesses, such as processing plants, testing labs, consultants and locally made hemp products. “But the foundation is the farmer,” he said.